Indestructible Canadian power-pop institution unleashes a sprawling rarities compilation that's as chaotic as the band's 20-year career. The power-pop explosion rumored to have occurred during the 1990s was more like some loud thunder off in the distance that permanently turned a couple of heads. Major artists of that bygone era like Matthew Sweet and Teenage Fanclub fell just shy of mainstream success before falling off creatively or simply giving up altogether. If the Canadian quartet Sloan were the band you pledged your allegiance to, however, you are still reaping the rewards. While their former touring partners in Fountains of Wayne are out assaulting eardrums with novelty songs about the munchies, Sloan have remained shockingly consistent without ever compromising (or updating) their sound. While boasting four singer/songwriters has clearly been the key to the band's longevity, it also kept them on the losing side in their quest for a perfect album. While the men of Sloan were born to sing together, their distinctly different songwriting styles sometimes don't gel so seamlessly. Bassist Chris Murphy generally writes straightforward pop while guitarist Patrick Petland favors chunky, arena-rock riffs. Underused second guitarist Jay Ferguson writes gorgeous '70s AM radio pop while drummer Andrew Scott's songs are often obtuse and shoegazey. These varied styles can be both a blessing and a curse, as oftentimes a band member will simply have an "off album." Sloan are best introduced to a new listener by trying to gauge which songwriter they might prefer. While every album Sloan released during the 1990s is a near classic, the band entered the '00s on fumes. The band's status as a critically acclaimed cult act who would always be popular in their native Canada and taken for granted everywhere else was pretty well cemented by this point and on releases like 2003s Action Pact, the band sounded a bit uninspired and boxed in by the limitations of the genre they identify with. Sloan released a greatest hits compilation in 2005 -- a move that could have easily been interpreted as parting gift to the band's fans. A new song recorded for the compilation was called "All Used Up", after all. Instead of fading into obscurity, Sloan shocked the world (or at least the ten thousand people who still buy a new Sloan record every two years) in 2006 by releasing the sprawling, 30-track opus Never Hear the End of It, an album that combined the pristine pop of their early career with the thunderous AC/DC-ready riffage of their middle years into something exciting and unexpectedly invigorating. Now entering their third decade as a band, the Sloanmen seem once again revitalized by the creation of an online store where their entire catalogue is available for streaming and purchase. The band christened the store in late 2009 with the winsome, self-released Hit & Run EP. Now they’re back with B-Sides Win: Extras, Bonus Tracks, and b-sides, 1992-2008, a 26-track collection that plays like a summary of Sloan's entire career: frequently brilliant, often frustrating, and all over the map in general. Like most rarities collections, B-sides Win is intended for super fans and completists. It was released digitally on the band's website without much promotion and, at 90 minutes, is too long to fit on a single CD. The package also contains a digital booklet featuring comprehensive notes on each individual song from that song's author. Save for a stray cover and a pair of remixes, most of the songs here were never intended for inclusion on the band's proper studio albums. It's almost impossible to criticize a song when its author states, "I have no idea why we even recorded this song", as Petland gripes about "Same Old Flame". While the band might not recall much of their work fondly, they needn't be so self-deprecating. Although the chronological sequencing guarantees frequent use of the Skip button, the album nevertheless contains some of the band's finest work. The collection begins with several tracks from the band's My Bloody Valentine period, where they often buried a song's hooks under squalls of white noise. "Sleepover" spends eight minutes going nowhere and "Rag Doll" sounds as if it should have been saved until the band was more in control of its craft. It isn't until Murphy's "D is for Driver" that everything starts to fall into place. All of the tracks recorded between 1994-96 show the band growing more comfortable as musicians, emphasizing melody and performance over production. With "Out to Lunch", the switch is thrown and you can hear the band morph into '70s arena rock revivalists for a few albums. Overnight, Sloan has turned into Urge Overkill, but with class and tact. The standout from this era is the wistful "Summer's My Season", which is as good as (if not better than) anything from its parent album, 1999s Between the Bridges. It speaks volumes about that album's flawless sequencing that a song as good as "Summer" still doesn't feel left out in the cold. 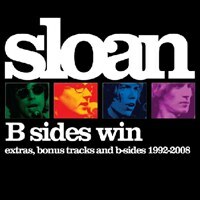 The bonus tracks from next couple of Sloan albums are all far stronger than the songs that actually appeared as a-sides. Ferguson, easily the MVP of this collection, penned "Pretty Together" in hopes that it would be included on the LP of the same name, only to see it dropped when technical difficulties marred its recording. Presented here in a spare acoustic home demo, "Pretty Together" is one of Ferguson's finest moments and easily the best song of this collection. Scott pitches in with the slow burning "Helen", his sole effort here and a solid one at that, while Murphy’s Stonesy "Had Enough" outshines almost all of his official Pretty Together compositions. Further down the line, Ferguson's Big Star homage "Step on it, Jean", is two pregnant minutes of power-pop nirvana. Songs from Sloan's late '00s revival are similarly consistent. It's hard to argue for a track left off an album featuring 30 songs, but Petland's summery NHTEOI castoff "Even Though" stands particularly tall. According to Sloan's website, there's more archival material due to be released in the not too distant future. While B-sides Win was never intended to be an album in the classic sense of the word, it functions remarkably well as such. Pared down to 12 songs, the album would surely be the finest power-pop record of this or any other year. Certain bands are just born to create albums and Sloan is surely at the top of the list. Now 20 years into their career, Sloan already have an intimidating catalogue of songs to their credit. Whether they saddle up once again and release four solo albums on the same day with each album cover featuring a respective Sloan member in full KISS regalia, or simply call it a day, B-Sides Winis a fitting reminder that Sloan have always been competitors.